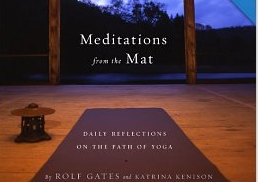 I’m on my fourth reading through of this amazing book, Meditations from the Mat: Daily Reflections on the Path of Yoga by Rolf Gates and Katrina Kenison. It was a gift back in November 2005 from my dear friend Celeste. I devoured it immediately, then came back to it in 2007 (was reading today’s post almost to the day in 2007), and in 2011, and here I am again. The truth is, we are all so very, very vulnerable. Life is as it is…The only thing we have control over is our attitude. We have the choice of life or death, love or fear, in each moment. And we bear the responsibility for that choice in each moment. The authors go on to say something that I took to heart back in 2007 when I was really stuck in my career. This one idea got me unstuck and has a thousand times since then (and, apparently, my sharing it is helping others – check out my friend Maureen’s Project Butterfly post from Sunday: http://maureenmonte.com/snow-butterfly/) . Every time we stretch beyond our resistance and our fear, we make a choice for life. And every time we choose life, we find that fear loses its grip on us. We all know more than we think we do, and we are stronger than we believe ourselves to be.